Do you have a handmade gift that you treasure? Are you wondering what to get family members and friends for Christmas this year? I thought it would be fun to put a list together of the many reasons one should consider giving handmade this year! Please feel free to add any additional ideas in the comments below! We all have that “hard to shop for” person in our lives right? Mine happens to be my sweet mother-in-law. She buys pretty much anything she wants. One year I gave her a hand stitched frame with one of her favorite sayings and it brought her to tears. There have been times when I will purchase something and it falls apart or even breaks during shipping. When you make your own gift you determine the quality by choosing the best supplies, techniques, etc..
You can create personalized gifts in so many different ways by including a favorite saying, name, color, pattern…endless possibilities! When you give handmade you can choose to create a one-of-a-kind gift that is unique to that person. A friend gave me a necklace and I always get asked, “Where did you get that?” I tell them that a friend made it. Sometimes it’s nice to wear or have something that nobody else has! 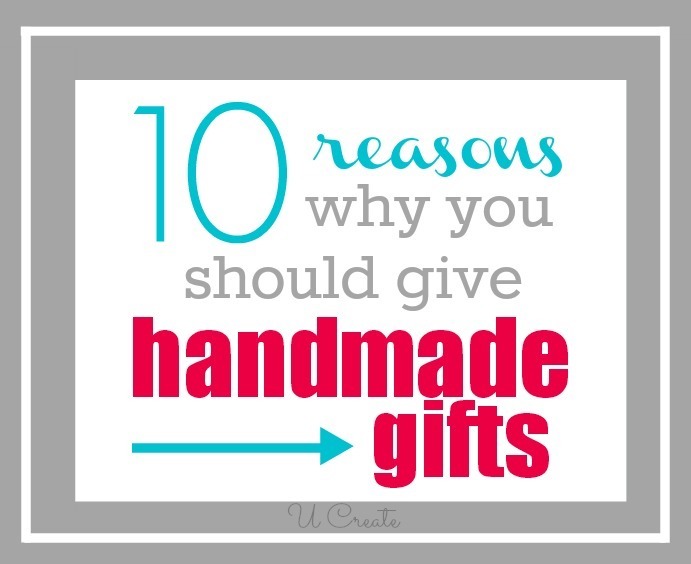 In many cases giving handmade is less expensive than purchasing. When you purchase something you are usually paying for the time it took to make the item. When eliminating the time factor you can usually save lots of money! My sister-in-law Danielle is the queen of giving thoughtful, handmade gifts! Last year she gave me a book of inspirational quotes that she printed out to inspire me and she included my very favorite candy. I feel special when I know someone really took the time and effort to decide what to get me. Creating something can be therapeutic or a time to get away from our busy schedules. It’s great to have any excuse to do what we love. My mother gave me a framed cross-stitch of a bride in a gorgeous wedding dress for my wedding. It took her a couple of years to make! If my house was on fire you could bet I’d grab that along with my precious photos. You have creative talents – share them! Finishing a creative project can give you such a sense of accomplishment right? Seeing somebody wear, use, or display what you created them, can give us that same feeling! that said, I do think that these days you have to be careful sometimes. There are people who just don’t appreciate home made. I try once and if doesn’t work, then I think long and hard before I’ll do hand made for them again. It can begin a tradition, making gift-giving less commercial. Love this list… awesome tips/reminders! Pinning!! Last year I started making homemade noodles using an old family recipe. My family loved them so much that I thought it might be fun to make them for friends and neighbors for Christmas. A homemade gift that could be frozen for later or eaten during a really busy time of year. So my kids and I all made noodles and packed them up with a whole chicken and chicken broth along with direction on how to prepare a homemade chicken and noodle dinner. It was the biggest hit of a gift I have ever given. And for special friends, I also included homemade cheesecake for dessert! Would LOVE the recipe! GREAT idea!!! Thanks for your encouragement. Most of my immediate family like hand crafted gifts, but some of the extended family seem unimpressed. I LOVE this list of reasons. I have a mother-in-law just like that. And, every time we have done Handmade it makes her feel so much LOVED and she can’t get over that we would take the time to make something for her. Thank you for sharing this with us! One reason I got back into sewing, besides no longer homeschooling my son after 10 years, was that I was diagnosed with aggressive breast cancer at age 40. All of a sudden, leaving a legacy behind meant a whole lot more to me. Now I’m cancer-free, and I have tons of great nieces and nephews to sew for. I’ve become what I told my sister….a great aunt who is fat and sews things. 😉 …just like ours were…but they seemed so much older! I did become a great aunt for the first time at age 37, so that’s part of the reason!